Akron Civic Theatre in Akron, Ohio. What kinds of things are over-the-top? Black Tap Milkshakes topped with cotton candy, chocolate chip cookies and/or everything that ever fell out of the cake decorator’s drawer are nothing if not over the top. Yummy--or revolting? Your tastes for excess will dictate. Ball gowns worn at the Diamond Ball or the Royal Wedding also come to mind. So do movie palaces, those cathedrals of excess that the movies in their infancy, combined with Vaudeville, caused to spring up all over the continental U.S., like so many glorious fast-growing mushrooms. The most outrageous example of one such theater in my neck-of-the-woods is the United Palace in upper upper Manhattan (Washington Heights), a Thomas-Lamb-designed combination of “Byzantine-Romanesque-Indo-Hindu-Sino-Moorish-Persian-Eclectic-Rococo-Deco,” according to The New York Times,which also called it a “kitchen-sink masterpiece.” What else would you expect of one of the five Loew's “wonder theaters”? Inevitably, what defines a theater as a “movie palace” is its size (arguably 1,500 or more seats) and its spare-no-expense excessiveness. Decor may take the form of blended styles, such as my own beloved St. George Theatre — Spanish/Italian Baroque, 2, 672 seats — which, in 1976, I had the privilege of helping to run, in the twilight of its movie theater career. From its admittedly garish paintings of bullfighters and senoritas in the main lobby, to the unidentified Greek goddesses that flank its stage, left and right, the St. George is, like the United Palace, a mish-mash, which can, admittedly, be either eclectic or just plain too much. There are probably people who sit inside the marvelous gilded cave of the St. George’s auditorium, or even the Spanish Gothic (Moorish?) Theater at Ace Hotel in L.A. and think, “this is too too much.” I am not one of those people, as you may have discovered. Well, either way you slice it, what is a movie palace if not "flamboyant" (Webster’s) and “demanding of attention” (Cambridge)? And yet, only the movies, those luscious waking communal dreams — the spawn of Edison, Muybridge and Vaudeville — could dare to produce interiors that featured electric-star ceilings and giant shrouded statuary. Nothing, you see, could compete for an audience’s attention with the likes of Garbo or Valentino, or the young Charlie Chaplin; or later, when sound arrived, with Bogart, Bergman, Gable, Hepburn projected on a giant single screen. It’s probably impossible to say which, of thousands of movie palaces, most of which were built in the already-flamboyant 1920’s, is the most over-the-top. Loew’s Kings, on Flatbush Avenue? The previously-mentioned United Palace on 175th Street in Manhattan? But how could you not consider almost all of Graumann’s theaters, especially the Chinese and the Egyptian? The Pantages? The Uptown in Chicago, happily soon to be restored? Because it’s so easy to flash to major urban areas, I’d like to give the spotlight to a “Moorish/Mediterranean” treasure, the Akron Civic Theatre (2,592 seats) in Akron, Ohio. None other than Marcus Loew himself (“we sell tickets to theaters, not movies”) chose Akron as the site of one of his “special” theaters, an atmospheric, to be designed by the esteemed John Eberson, master of that style of theater architecture. Before Loew happened on the scene, a local dance-hall entrepreneur had begun a theater on the site, but his pockets were empty. Loew bought the half-begun effort at a Sheriff’s sale and began to build. On its opening night in 1929, Loew’s Akron, as the theater was to be called for a long while, offered audiences a Moorish castle, from whose courtyard the patron can to this day gaze upward at “a twinkling star-lit sky and intermittent clouds moving across the horizon.” Now what can be more over-the-top than a Moorish Castle with stars and clouds in its courtyard, Italian marble statuary, and a staircase which is said to contain echoes of the staircase at the Paris Opera House (which Loew apparently admired)? Why Akron? In the early 20th century this industrial city was the “rubber capital of the world,” which meant a lot in the nineteen twenties, when “horseless carriages” were all the rage; and Marcus Loew was an entrepreneur who knew a burgeoning middle-class market when he saw one. Akron (from the Greek for “elevation”) was on fire population-wise in 1910, continuing to the twenties with an increase of 201.8%, which meant double the number of patrons standing in line to gaze at electric stars, catch a little Vaudeville, and watch a movie. Like all but a few movie palaces, Loew’s Akron fell on hard times in the seventies and beyond, when movie palaces seemed about as useful to most folks as yesterday’s ball gowns. It was rescued by a lot of determined local citizens, but I’m saving that story for an upcoming blog post on how movie palaces that are still here managed to survive into the new century. It’s a “perils of Pauline” kind of story. When I was a movie theater operator, in 1976, at The St. George Theatre, a Spanish Baroque palace in Staten Island, the “distributors,” who actually owned and produced the movies we ran, were definitely a boys’ club. You didn’t cross them — i.e. fail to pay what you owed for a movie, however much of a doggie it might be. The Sailor Who Fell From Grace With the Sea, Gable and Lombard, and some other titles come to mind. Our right to exhibit a particular movie was spelled out in a contract (yellow carbon, as I recall), but the big boys could tear up that contract any time they wanted to and force us to pay more. ​This actually happened when we ran the “director’s cut” of The Exorcist, and, surprising everyone including ourselves, managed to fill all 2,672 seats in our single-screen auditorium for several halcyon nights. We were under contract to pay them the usual one-third of the house, but, seeing the numbers we honestly reported, they immediately tore up the contract and demanded a higher percentage. There was, of course, no taking Fox, Warner, MGM, RKO, Paramount or UA to court: they had the product, and we didn’t. Truth be told, lowly exhibitors like us weren’t the only ones who were running in the red. Despite having slashed their budgets and jettisoned their stables of under-contract actors (the studio system), distributors were struggling too, after a fashion. During the so-called “golden era,” they’d owned their own chains of theaters, back when the board game Monopoly was still being played with hand-carved pieces. Then a monopoly-busting piece of legislation, United States v. Paramount Pictures 334 U.S. 13 (aka The Hollywood Antitrust Case of 1948) put an end to all that, and set distributors and exhibitors on opposing sides of a new game board of the U.S. Supreme Court’s making. As a theater exhibitor, it seemed odd to be in an adversarial relationship with the MGM Lion, not to mention Columbia’s lady with a torch, or 20th Century Fox’s marvelous searchlight-lit stone letters. These and other logos had helped us settle in our childhood seats, popcorn cradled between our knees, since anyone could remember. The logos seemed like friendly presences, like the Warner cartoons that preceded them. But there’s nothing free — or friendly — about free enterprise; you can get a sense of how cut-throat it actually is, by rolling the dice and advancing your token to Boardwalk, when your Monopoly opponent has cluttered the place with hotels. The thing about Monopoly is that everybody starts out a small guy; and though that isn’t generally true of entrepreneurs, it happens to have been so for many of the distributors. At its inception, United Artists was owned by actual artists! — Mary Pickford, Charlie Chaplin, D.W. Griffith, and Douglas Fairbanks. The stories behind the big guys are little-guy scenarios, back when film was in its infancy. Something about the acorn and the oak applies here. I’d like to dedicate the rest of this post to the evolution of 20th Century Fox (I’m not interested in 21st Century Fox, currently the 4th-largest media conglomerate in the U.S. Media conglomerates are not my beat). Anyhow, how tiny was Fox — once? William Fox was, like so many of the original film moguls and other denizens of showbiz, an immigrant — in his case, from Hungary. Like Roxy Rothafel, he got his start in a tiny storefront, a nickelodeon on Manhattan’s Lower East Side. Movies were hand-cranked, the new and startling imagery appearing on a simple painted wall across the room. That was 1904; just eleven years later, Fox was still charging five cents a head, but had a chain of storefront theaters to show for all his hard work. Now think about it. How did a bunch of seedy storefronts grow into the logo with the searchlights whose stock is traded on Nasdaq as a class-A? I know, I know — I wasn’t going to mention media conglomeration; but, like many Americans, “free” enterprise fascinates me, because every once in a while somebody goes from rags to riches, and William Fox was one of those somebodies — for a while, at any rate. By 1913, he was arguably the most successful of the new independent exhibitors, leading a revolt against something called the Motion Picture Patents Company, aka The Movie Trust, a brief monopoly that included elements as various as Edison and the Méliès brothers. The Trust refused equipment to anybody they didn’t like, limiting film length to 20 minutes, refusing to allow actors to be identified, and allying themselves with the up and coming giant, Kodak. But thanks to the Progressive Era, antitrust law was all the rage. Congress established the Federal Trade Commission in 1915, and, in 1917, the Movie Trust was dissolved. Since it had flourished on the East Coast — largely in New York — its death created Hollywood, where independents and creative types, including William Fox, fled to get as far away as they could from all that rampant greed. With Fox Film Corporation. William had already introduced organ accompaniment to film, had begun building movie palaces, and promoting stars, the first of which, Theda Bara, became a notable vamp, and the first real movie star. Fox’s greatest contribution may have been (1927) the news series Movietone News,the first commercially successful sound film. It had evolved from a silent series, Fox News — a far cry from the jewel of the Murdoch empire that uses that moniker today. Now here’s the sad part: converting 1,100 theaters to sound cost a lot of money. That, combined with an anti-trust action initiated by disgruntled competitors, an auto accident he barely survived, and the stock market crash of 1929, ruined William Fox. He lost control of his company in a hostile takeover, and declared bankruptcy in 1936. After attempting to bribe the judge, he was convicted for obstruction of justice and did time in prison, emerging in 1942. He retired quietly to Long Island, and died in 1952. No one from his Hollywood days bothered to come to the funeral. As for his company, it had been gobbled up by National Theatres Corporation, back in 1933, which then became National General and was sold to Mann Theatres in 1973. Of course, by then, antitrust laws had further separated the chaff of theater exhibition from the grain of distribution, so you could say the original Fox Film was gonzo in every sense. The boneyard of free enterprise is filled with such stories. What’s left of William Fox? His name lives on, in some notable theaters, among them The fabled (mosquel-like) Atlanta Fox, the Detroit Fox, the Redwood City Fox, The Oakland Fox, reminiscent, it is said, of a Buddhist temple, and I could go on. Out of a list of better than a hundred theaters which once bore the Fox imprimatur, roughly forty are standing, and still a theater of some kind, whether or not Fox’s name is on the marquee. In my hometown, Cincinnati, the Twentieth Century Theatre made me think of Fox, which is what counts. That theater is still in operation, with its signature sweeping vertical Deco signage. These days it’s a nightclub, (not, I’m happy to say, a church or a drug store, like so many former palaces). What’s in a name? Well nothing, really. William Fox, whose only legacy, his name, lives on in conglomerates and movie marquees, was actually born Wilhelm Fried. That’s showbiz. Afterthought: Since I mentioned MGM’s lion logo, don’t miss this, whatever you do. There are, as I dimly recall, 13 steps, very high risers, that lead from the space at the back of the St. George Theatre’s upper balcony to the tiny pair of rooms we used to call “the booth:” a bare bulb hanging from the ceiling, two sash windows and a skylight with stairs to the roof. Two hulking carbon arc projectors, circa the 1950’s, brought the image to the screen, a half a football field away, thanks to a spark of fire ignited by the charge between two carbon rods. (They were expensive, these rods, and running out of them was a tragic experience.) The film arrived weekly in steel canisters, each reel containing only around 20 minutes of viewing pleasure, which is to say, three reel changes an hour. That’s how it was in 1976, when I was part of the last effort to run a 2,672-seat Spanish Baroque palace as the movie theater it had always been. It was the end of an era. After we left, the St. George went dark, so the booth never did go through the revolution in movie projection that followed the seventies (resulting in the “platter’ system), let alone digitalization, which has liberated theaters almost entirely from the need to hire projectionists. For another analogy, if the projection booth were part of a sailing ship, it’d be the “crow’s nest,” highest point of the main mast, where the lookout looked out. That’s how it was on ships, and how it was in theaters too. You had to just completely get into the Zen of it...The cue marks were a sixth of a second in the upper right hand corner. A sixth of a second is about the time it takes you to do kind of a normal blink. So if you had a normal blink, you could have — oh, did I just miss that? (Laughter) And until you learn the film, you wouldn't know. And one of the worst things for a projectionist was to get emotionally involved in the content. In a horror movie, that used to happen to me. Somebody would jump out with an axe, and, oh, you'd miss the cue mark. You can tell Madden was a good projectionist because his danger was that he might become “emotionally involved in the content.” Our projectionist — Gabe — on the other hand, often had no idea at all what was on screen. Case in point: when we ran Enter the Dragon (1973, a classic Bruce Lee Kung Fu), Gabe laid an egg. He called down to the candy stand, “Hey, I’m sorry man!” but nobody knew what he was apologizing for. He’d apparently run reel 1, then reel 3!. But with minimal plot and maximal punching and kicking, nobody’d noticed, so no harm done. Dean directed him to run reel 2 then reel 4, followed by 5 and 6. The audience left without complaint. Afterthought 1 For a really smart treatment of the art of projection, check out the source of the NPR quote. ​Afterthought 2 Our friend Robert Endres, the projectionist’s projectionist, was interviewed for a post on May 27, 2015. it is entirely possible that he knows more about projection than anyone else on Earth, though he’d modestly deny that statement, if asked. Check out his view from the booth. Bob, BTW, started out at his local theater in Streator Illinois, when, as a boy, he was caught peeking through the keyhole at the projectionist’s world. The second Blackfriars Theatre by G. Topham Forrest, The Times, 1921. The Fourth of July makes me think of domes. What is a dome after all, if not an evocation of open sky? And fireworks against a sky are what the 4th is about. Fireworks are people-made stars... Grand Central in NYC makes me giddy each time I walk under its electric constellations. I remember a moment that dates back to my twenties, when, having survived a car trip up the FDR drive on New Year’s Eve Day, with a man so drunk I feared for my life, I spilled out of his Volvo and into Grand Central, and, after a brief passage emerged at last, under its comforting vaulted ceiling. Admittedly, I was drunk too, and in that moment, delighted just to be alive. The dome of the 2,672-seat movie palace I worked in a few years after that, the St. George Theatre in Staten Island, sends me into transports of an entirely different order. Theaters have their own light, a whole history of it, as a matter of fact. Oddly and interestingly, the very first (Greek) theaters used natural light the way a modern lighting director or projectionist uses artificial, as an integral part of the show. Those first comedies and tragedies took place in the open air, at the top of the day. The sun, far from being a hindrance, was frequently used like a spotlight, with mirrors to enhance certain dramatic effects. Greek amphitheaters were “in the round,” built with the time of day in mind. A few centuries later, the Romans made a business of the whole thing, extending the possibilities for performance in settings like the Coliseum, to night, with the addition of torches, candles and lanterns. Better than a thousand years later, if you’d attended a performance at Shakespeare’s Globe in London, you’d have thought you were living in Greece. The Globe was a three-story open-air amphitheater, dependent on sunlight and good weather. Not until something called Blackfriars appeared did Elizabethan theater move inside, with sixteenth-century “artificial lighting.” In addition to torches and lanterns, there were novelties — “dimmers” (on candles) and colored filters that had found their way across the Channel from Italy. In the seventeen hundreds, the kerosene lantern arrived, and lighting became stagecraft. Oil lamps and Lime Light (a spotlight made by heating a piece of lime with a flame of oxygen and hydrogen) followed. Then gaslight, and finally in 1881, London’s Savoy Theatre (home of Gilbert & Sullivan) installed incandescent lighting. Theaters had morphed gradually into domed windowless halls. Not only did natural light interfere with the waking dream of the play, but that great theater mystery (sometimes called a science), acoustics,seemed to fare better in rounded seamless spaces. 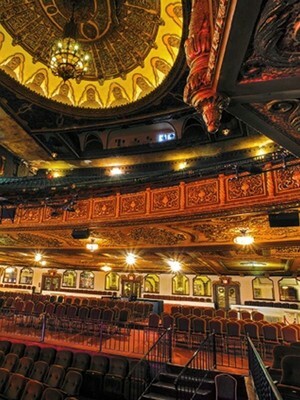 Seated in the mezzanine of the St. George Theatre last friday night, for a Steven Stills/Judy Collins concert, I had plenty of time to study the recessed dome, its edges where they meet the ceiling, pinched back like a skillfully-wrought upside-down pie crust. Grottoes left and right of the stage, containing matching goddesses draped in maroon velvet, and the heavily gilded proscenium, with hardly a square foot of unadorned wall space, gave me plenty to look at, fascinating as an ancient cave, its walls adorned with gazelles and bison. The theater is an iced cake of gilt plaster and drapery that warms to any voice, especially the unaffected sweetness of Collins' mature a cappella soprano. That voice penetrated every niche and all the crenellations of the great dome, reminding me of one cold February night in 1976, when a friend of mine who was helping run the theater and happened to have a natural operatic soprano voice, stood center stage without benefit of a mic and belted out “Amazing Grace.” It has been 42 years, but it could have been yesterday; I believe the voices that have sung under the dome are caught and held there, keeping each other company for as long as the building lasts. May sunlight never enter there. Afterthought: How could I not mention atmospheric theaters in a post that deals with artificial light in domed spaces? The ultimate turning inside-out of a dome, is when the ceiling IS the sky! John Eberson, that genius of turning architecture inside-out, designed and built over a hundred of these wonders, beginning with the 2,800-seat Majestic in Dallas, Texas. The Paramount in Anderson, Indiana gives a video tour worth taking, and don’t miss the Avalon in Chicago, via Matt Lambros whose work documenting movie palaces in all states and conditions never fails to move, astonish and delight me. An earlier post on atmospherics tells more.